So I've 'teamed up' with ASOS to give you a little back to school outfit inspiration. I'm heading back to uni in a few weeks (sob) so this is one of five outfits I might pull together. I go to a fashion uni in central London, so anything is acceptable in terms of clothing. Surprisingly no one on my course is too dressy, but I always dress as I would for a day in central anyway! I love this striped jumper, I'd layer a longline wool coat over and throw some tights on when it gets a bit chillier, however it was so so hot when I shot these, and as you can see from the tone in the photos - the sun was setting on me! What kinda thing do you wear to uni, are you a jeans and t-shirt gal? I love this so much! 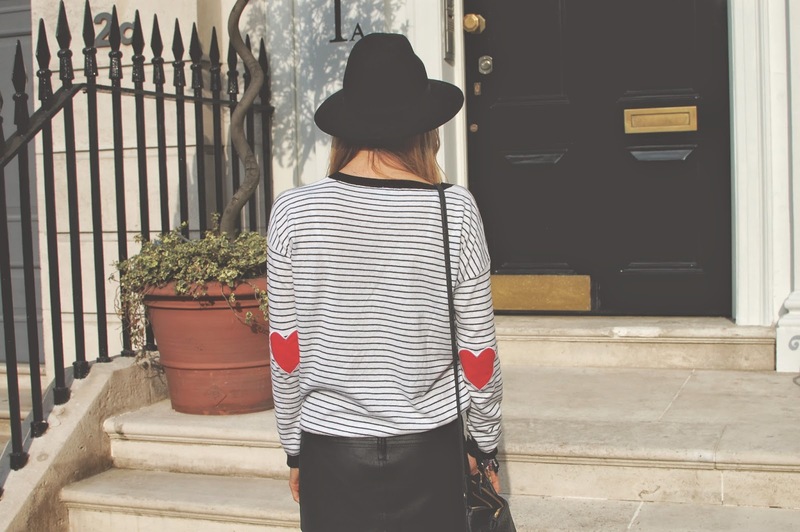 The heart elbow patches on your jumper are so so cute! A lot of people on my course aren't too dressy, but I'm like you and I always love putting effort into my outfits! Great look, love your hat. Such an effortless yet stylish outfit! Lovelovelove your outfit! Especially the boots and the skirt!